Stereo.type, the subject of the current exhibition at Kendra Gallery, is one of the myriad projects of artist-designer-activist Ebon Heath. It consists of metamorphosed typography which transmits subtle messages about printed words themselves and their broadest meanings. The title Ebon selected for his website, “listeningwithmyeyes” voices eloquently the peculiar effect of freeing typography from its familiar context. Text moves from the page into the atmosphere, where it is more seen than heard-in-the-head, as one hears words while one reads them on a page. Released from the page, text can be sensed in new ways. Ebon is experimenting with a form of synaesthesia, which I suspect he feels himself and always has, in relation to text and typography. No surprise then, that Ebon has for over a decade been a pioneer in graphic design, exploring divergent paths in typography, and in other graphic means to transmit urgent and potent messages. His graphic work evidences an innate understanding of the prevailing conditions of his clients’ publics. He fathoms just how deeply we wallow in a surfeit of text, messages, text messages and constant clever clamoring after our attention. Ebon seems to propose his mobiles as a means to float above the imperatives of prolific message making. They are not the products of an assignment to Ebon the graphic designer, requiring him to hit a target with a specific message shot from a grassy knoll into a cluttered world. Rather, they seem to be his own response to the nebulous nature of the printed word itself as a phenomenon. And equally, as an expression of Ebon’s own understanding of that phenomenon, or cluster of phenomena, after years of deployment on missions as a sniper on the battleground of printed messages. Me, I can’t help but like this stuff, as a veteran of the sharp-shooting message squad myself (JWT, O&M, etc). I’m not sure that Ebon has achieved the full effect he hopes to achieve with Stereo.type, yet. Nevertheless, his trail-breaking at this juncture still affords us access to paths that were not previously available. In other words, there is value in the Stereo.type project, and one would do well to follow its course and expect even greater work as Ebon conjures forth his word-clouds (as above, at Kendra). The art products comprising Stereo.type are primarily undulating and exploding mobiles of typography which release printed words from the constraints of the two dimensional page. Words hang in the air. Words fly. Poetry floats. We are invited to feel in a spatial and physical way how real words really are. As embodied beings ourselves, we witness an analogous embodiment of the texts that fill our world. In this way we can begin to comprehend what the printed word is actually doing in our world, from religious texts to text messages to political campaign slogans. Everything written, printed, and distributed is hovering in the atmosphere around us, twisting and drifting like Ebon’s mobiles (above). As text is decontextualised in Ebon’s artworks, so is the artist himself deliberately decontextualised. He drifts wantonly away from the orthodoxies of the contemporary art market, disregarding agreed-upon categories of fine art as we know it. He is colouring outside the lines that separate fine art from, say, interior decoration, graphic design, body ornament and indeed, activism. Ebon’s mobiles are “going retail” later this year as constituent elements for high-design interiors. As are other Stereo.type art products, including laser-cut typographic earrings, cuffs and belts (above). 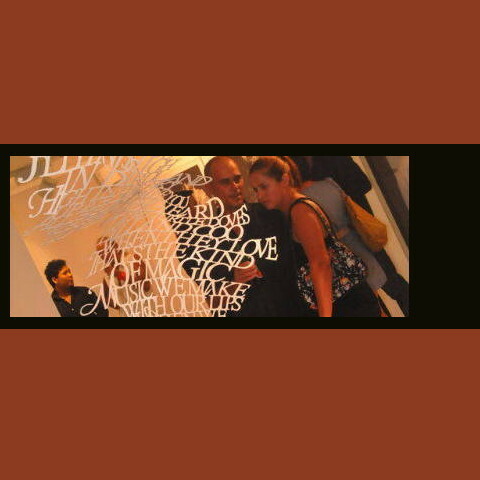 Photographic prints are another form of art objects within the Stereo.type project (above, visible to the right of a word-cloud). A dozen or so of these these limited edition prints are avaible through Kendra, and several are hung in the gallery now. They twist the text-to-art story into yet another permutation, by first taking the printed page into three dimensions (mobiles), then intentionally flattening it out again (photographs of mobiles), but with its earlier 3-D state having transformed the text in disorienting yet salient ways. It’s all as twisted as the morphed, warping words whirling slowly in the air-con at Kendra, now through 16 May. Go. Spend an hour or two in the gallery if you are in Bali, and consider how words and text exist among us, take form, move, morph, move, and insinuate themselves into our very atmosphere. Kendra is situated at Uma Sapna, one of the few well-designed boutique villa hotels in Seminyak. It, and Kendra Gallery, were discreetly created by their ineluctable éminence grises, Bruno Wauters and his enchanting partner Sekar Warni (above, third from right, beside interior designer Laure DeGuillaume and architect Cheong Yew Kwan). Given the fact that Ebon was staying at Uma Sapna, he was understandably inclined to recharge – – after three days discharging the painstaking duty of affixing innumerable strings of typography to walls and ceilings he had never seen before. But lo and behold! The artist ultimately emerged! At the very moment the crowd reached maximum numbers, which were impressive numbers indeed (see above), Ebon Heath popped out like a rabbit from a hat, and proved to be remarkably personable, approachable, affable, relaxed, and generous in answering questions and discussing his work – – not to mention, beaming smiles for miles. I guess the mattresses and sheets at Uma Sapna are top-drawer, and the rooms are as serene as a Trappist monastery. It seems that a two-hour siesta there is equivalent to eight hours of shut-eye anywhere else. Ebon talked about some of the texts hovering over our heads. One was a composition by Indonesian poet laureate, Chairil Anwar (I’m a fan), rendered here in muted gold and black (above). Another was an enormous black and white, yin-yang cloud of Koranic verse tangled with excerpts from the Tao Te Ching, with each text in its original language and script. This particular piece gave me pause for thought, particularly as I was wearing a handwoven poleng scarf (below, with Eric Tourres and his family). Ebon was interested in the connection to Bali’s checkered poleng cloth, which represents the concept of rwa binneda, the inseparable interdependence of opposites. On this occasion, poleng was certainly apropos. I purchased a pair of Ebon’s typographic earrings from the exhibition, which proclaim “push-pull” in Arabic. One earring is black, the other white. I put them on immediately. I also bought a single earring for Welldo Wnophringgo (below), an unforgettable local artist whose life and whose physical presentation are both an ongoing installation and performance work. Welldo accepted the earring gleefully, and you will now have to ask him directly to read his Arabic text earring to you. I am quite certain he will be wearing it. He wears basically everything, and then some, with tremendous commitment and care. Ebon joined Kim Randall and a crowd of Kendra patrons and friends for dinner after the vernissage at Chandi restaurant on Jalan Oberoi, which is now our kitchen-away-from-home in Bali. Never a bad meal, and we return again and again for their daily specials, and their superstar standards, notably “Agung’s Black and Red Nasi Goreng,” which has become a staple of our diet, particularly as it comes in both seafood and vegetarian versions. What a plate. We hope Chandi doesn’t become a victim of its own popularity as so many good restaurants in Bali have. Ebon was still woven tightly into the Kendra circle when I went home well after midnight. We hope to see him again in Bali, and with any luck, one of our local design-driven new boutiques like Word of Mouth (playground of Valentina Audrito, above right, with Sekar Warni and Cheong Yew Kwan), or Paola Zancanaro’s Namu, will pick up his jewelry, belts and mobiles so they can be acquired in Bali without having to come in the luggage, as so many worthwhile things must these days (wine not least among them). Finally, do go see some of Ebon’s story on his website. It’s a story that includes RISD (helloo . . .), Kenneth Cole (helllllooooo . . .), a successful self-started consultancy doing issue-based media strategies for non-profits, NGOs and brands (no hello or goodbye necessary). And more. And do have a look at who turned out on the night in Bali (above and below), and how well they were turned out. There is certainly not a burgeoning serious art scene in Bali, there is an active, serious, intelligent, international, and interesting art scene here in full flower. The future is now. Witness Bali. Of course, this particular art scene would be more bubbling if the daft delusional bapaks in Jakarta repealed the ridiculous duties and taxes on alcohol here, which now run around 400%. Even Malaysia doesn’t do that. And it contravenes APEC and ASEAN treaties. What a foolishness, what a fiasco, what a supreme act of self-sabotage. What a sure-fire way to alienate the travellers who can do the most for Bali and bring the most and cleanest dollars. If it weren’t for such stupidity (and it is simply stupid), we would have had bubbly galore at Kendra, given there was so much to celebrate. Who was celebrating? Unphotographed friends present included Susanna Perini of Biasa, eboniste extraordinaire Etienne de Souza, jeweler Frederic Bonnet, photographer Alessandro Luppi, 24K Kendra assistant manager Lalita Rachmania, Yakker Sophie Digby, fashionista Simonetta Quarti, Ubudian fine-financier Cryil Battini, plus an all-star cast of thousands. As for photographed friends, see images above, and plenty more below. Roberto Canale of Biasa Artspace (left), and friends. Pascal Morabito of Morabito Art Villa (in white at centre), at left are his wife Marie-Ève and his exceedingly tall son, and at right are the artist, and Bruno Wauters of Kendra. Bruno Wauters of Kendra and Uma Sapna with prominent Bali-based Italian painter, Mondo (left). Left to right, Maya Klat (scion of veteran Himalayan art dealer and Bali resident, Chino Roncoroni), her husband architect Diego Klat, and Miss Iin, formerly of Biasa Artspace, now “at large”. Painter-designer Kirsty Ludbrook (Mrs. Richard Ludbrook), photographer Richard Ludbrook, and Robert Rosen who is one of Australia’s foremost social photographers and an astute observer of Sydney Society. Rosen has been in Bali working on poignantly pointed on-the-street portraits of transvestites in Jalan Dhyana Pura. We would love to see an exhibition of this series of images. BGFs: Kim Randall of Kendra, and Gaby Wehn, photographer and founder of LVDK Productions. Love love love. Gaby wears Monica Benet necklace. The poleng scarf of yours truly figures at centre, amid the growing crowd. Maya and Diego Klat arriving in style. She’s wearing a one-of-a-kind dress from Simple Konsep Store, which look likes it was made just for her. Gorgeous. The galleries where the Indonesian artists go are the galleries to go to. Bintang sur l’herbe at left in foreground. It hadn’t rained just yet . . . but it did. Clouds. Crowds. From left, that’s Ebon in the green dread-cover, Yew Kwan vanishing at lower left-centre, yours truly in black and white, clutching a catalog (where did that catalog go?) at right under the cloud. Stephanie Robert of Maison Bulle (subscribe to their newsletter read their website news page Pulse), with Marco Lastrucci of Quarzia, a high fashion batik atelier with retail on Jalan Oberoi, not far from Elite Havens. Kiwi film director/producer Jason Moon (right) and friend. Gorgeous Gaby of LVDK Production with our new pal, designer Monica Benet. Both wear Monica Benet necklaces and accessories. Filippo Sciascia (Bali-based Italian multimedia artist and painter, recent solos at Gaya and Kendra, two-mans at Biasa and elsewhere), arriving with friends. We rarely see such ebullience at a vernissage. This one was effervescent, start to finish. Bruno Wauters of Kendra, with artist Filippo Sciascia, reading the clouds. P.S. If the lighting in Kendra were not amped up as if to illuminate a Jakarta Ferrari showroom, the subtlety of these and previously-exhibited artworks could perhaps be better appreciated. If they lit beautiful women like that, even Kim Randall might look like a frozen mannequin. Hint, hint. Or maybe we’re supposed to wear our black Persols. But then it would be difficult to listen with our eyes. Images © Kendra Gallery of Contemporary Art, by IGA Eka Suwintari of Windia Studio, Bali. Thanks for sharing, Susi! While reading the story, I feel as I would attend the vernissage as well. It's very nice to see so many known faces in a surrounding like this. I like Ebon Heath's art. Wonderful. BTW, we all miss you in Bali. Inez, Youlanda, Sakti . . . we've all been missing you. You should have a look at Inez' Facebook page, she's got great pictures of the newest batch of ICON puppies.